The Al Habtoor Group has partnered with some of the world’s best-names to create a new destination for citizens, residents and tourists alike. Al Habtoor City will undoubtedly become ‘the’ meeting point at the centre of Dubai where each component within the development will have its own personality. On average, 20,000 visitors are expected to visit Al Habtoor City every day, up to 7.3 million visitors a year. Al Habtoor City will help Dubai compete with destinations such as New York, London, Paris and Hong Kong. Located in a prime location – overlooking the Burj Khalifa in the Business Bay area and near the Dubai International Financial Centre – the development will be unique to the United Arab Emirates, offering top-rated hotels which will add more than 1,600 rooms to the city. In addition there will also be a spectacular water-themed theatre for a permanent production by the world-famous theatrical director Franco Dragone. Al Habtoor City has the added benefit of being on the banks of the Dubai Water Canal. The 10 million square foot development, erected on approximately a one million square foot plot, will feature three world-class hotel brands from Starwood – including the first-ever St. Regis in Dubai. Plus, it will have the added attraction of spectacular entertainment. It will combine ultra-luxury hotel living with 5-star residential ambiance. The group has commissioned leading British architects WS Atkins for the development of the residential blocks. It has also appointed Knight Frank to provide retail consultancy expertise for the podium under the residential towers and Asteco Real Estate Services will manage and lease the towers and retail outlets. Al Habtoor City’s residential living will embody exclusivity – residents and visitors will not need to leave the complex. They will have access to multiple amenities within the complex – including swimming pools, a gym and spa. There will be shops, cafés, a supermarket, a crèche, a clinic as well as access to all the high-end facilities in the three adjacent top-rated hotels. Each of the towers will house a single-storey 720 square metre Simplex penthouse, and two 2-storey Duplex penthouses ranging from 795 square metres to 820 square metres. Every penthouse will include its own private sky garden and swimming pool. The two taller blocks will each feature a massive 4-storey VIP penthouse with over 3,000 square metres (32,300 square foot) of living space. The two VIP penthouses, on levels 72 to 74, will have seven bedrooms including an opulent master bedroom, garden terraces complete with a swimming pool and Jacuzzi. The two top floors will provide residents with a private entertainment area offering them a pre-function room leading to a 584 square metre open-plan sky lounge completely surrounded by glass – and offering a 360 degree view of Dubai. Residents of the VIP penthouses will be ensured exclusivity. Special access cards will grant them priority use of the residents’ lift, which will not stop at any other floor while carrying a VIP resident. The lift will take them to their front door in under 30 seconds from the ground level. The two VIP/Presidential-style penthouses will be über-stylish, fitted to the highest standards, with the most exclusive finishing materials from some of the world’s top brands. There will be three Simplex penthouses in the residential towers; one in each of the tower blocks. The Simplex layout covers nearly 800 square metres. The mirror image living and dining open-plan area overlooks a swimming pool and Jacuzzi in a landscaped decking area with spectacular views as far as the eye can see. The layout includes a separate living room and generously-sized kitchen area. There will also be a spacious en suite master bedroom along with four further en suite bedrooms. 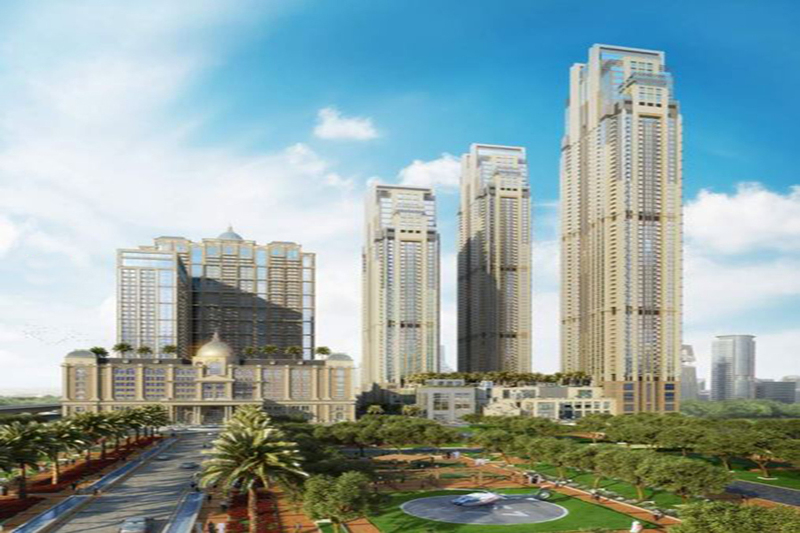 Al Habtoor Group is planning for a total of six Duplex penthouses; two in each tower. The Duplex penthouse will measure 862 square metres. An L-shaped open-plan living and dining area overlooks a large swimming pool and Jacuzzi complete with decking and a lush garden. There will also be an en suite guest bedroom and large kitchen area along with maid quarters. The second floor of the Duplex penthouses includes two large master suites and three further bedrooms as well as a home theatre. To add to the luxury experience, Al Habtoor City will offer upscale retail outlets lining the boulevard and waterfront to complement the more than 30 food and beverage outlets within the hotels. The outlets – including al fresco dining and Dubai’s second Bentley Boutique Café – will enhance the relaxed atmosphere of this vibrant community. The Bentley Boutique Café will be exclusive to Dubai. Al Habtoor City will become the centre of Dubai, the place where residents and visitors can conveniently find everything under one roof. Al Habtoor City will incorporate a state-of-the art tennis academy with eight courts – including a covered, air-conditioned court. Members will be able to enjoy all the amenities needed for a healthy and active lifestyle at the adjoining Club House. The complex blends a concept by British architects John R & Partners with detailed development by Khatib & Alami, one of the Middle East’s largest architects. The three hotels within Al Habtoor City comprise of Dubai’s first-ever St. Regis, a flagship W and a new Westin, with more than 1,600 keys between them. They will be operated by the internationally renowned Starwood Hotels & Resorts Worldwide. Each hotel will offer spectacular views of the Dubai skyline and offer a variety of exquisite restaurants and bars and state-of-the-art meeting facilities. Offering a new standard of luxury in Dubai, The St. Regis Dubai will feature 235 luxuriously-appointed guest rooms, including 49 elegant suites. The 5-storey hotel also offers extensive state-of-the-art meeting and event space as well as a wide range of luxury experiences with eight distinctive culinary, lounge and bar venues, a signature spa, swimming pool, a state-of-the-art fitness centre and an elegant ballroom. The St. Regis Dubai features multiple gardens including a Musical Garden with mosaic musical notes leading to the centrepiece: a musical fountain. The hotel will also feature a Reception Garden, a Promenade Garden and a Sculpture Garden, all offering space for outdoor functions. Complimenting the hotels bespoke services, the grounds of The St. Regis Dubai will include a private helipad to cater to its VIP visitors. A flagship hotel for the brand in Dubai, the new W Dubai – Sheikh Zayed Road will provide a cutting-edge lifestyle experience, comprising 355 luxurious guest rooms including 60 suites, six ‘WOW Suites’ and one ‘Extreme WOW Suite’ – the first of its kind in the world. The 27-storey hotel will offer eight contemporary dining venues, W Lounge (W’s take on the traditional lobby), WET pool deck, SWEAT fitness centre, a signature spa and stylish meeting and event spaces. The Westin Dubai – Sheikh Zayed Road will feature 863 guest rooms and 146 suites, including a Presidential Suite and Royal Suite. The guest rooms and suites of the 37-story hotel will be outfitted with the renowned Westin Heavenly Bed as well as the Heavenly Bath®. Other signature features will include the Westin Heavenly Spa, consisting of six treatment rooms and the WestinWORKOUT fitness facility. The multi-billion dirham development will also feature a one of-a-kind entertainment theatre. The Al Habtoor Group and Franco Dragone Entertainment Group have teamed up to bring a touch of Las Vegas to Dubai. The two well-known names will offer the only permanent water-based theatre production between Las Vegas and Macau. Franco Dragone, whose name is synonymous with the entertainment world, was the mastermind behind the Cirque du Soleil productions before starting his own company in 2000. Dragone is already a big hit in the UAE, following his Abu Dhabi creation and visual poem ‘Story of a Fort, Legacy of a Nation’. The venue of the purpose-built theatre, designed by Paris-based designer Jean Rabasse, will open in 2016. The theatre auditorium will be 30 metres high and have a capacity of 1,400 unique seats. Lights, sounds and water elements will come together at the Dubai theatre to create an extravagant and spectacular show. The Dubai Water Canal will pass alongside this mega project. The multi-billion dirham canal project, which goes through populous areas, connects Business Bay with the Arabian Gulf. It is designed by the Government and RTA to add another key tourist landmark in Dubai. Al Habtoor City and the Canal project are due to be completed at the same time.